"Tangerine Tango" is Pantone's Color of the Year. It just so happens to be my favorite color, so I am a happy advocate. Orange is arguably the loudest color on the spectrum. Decorating with it makes a statement that you aren't afraid to take risks. I believe the point of design is to take risks, as I strive to nudge people out of their comfort zones. But I can only nudge so much. 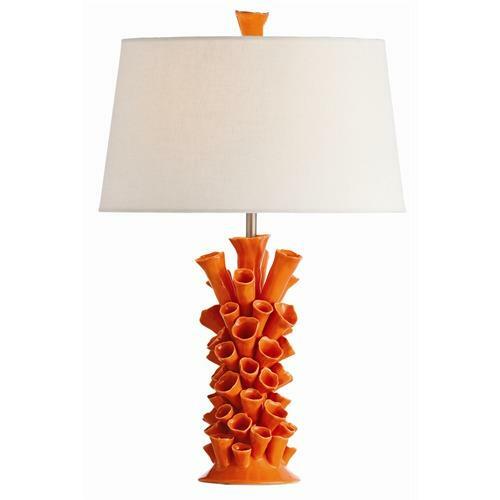 If your aesthetic is on the drab side, take a healthy dose of orange. Two quick ways to embrace it are with rugs and lamps. Rx: Splash some orange onto your floor. It sounds frightening, but it can be stunning. Having a few different shades makes it easy to coordinate with accents that aren't one exact color. This rug starts at $25. This looks crazy busy, but, if placed correctly, it'll work! Jonathan Adler Zebra Rug, $995. With such a basic (lack of) print, you can go town with bold accessories. Starts at $200. This is on the traditional side, but bold nonetheless. Afghan rug, Pottery Barn. I love grand lamps. This one from CB2 is awesome, but I would not recommend it for a small room. It would be best suited in a large, loft- sized room, over a nice club chair. Classic shape, but interesting material. $300. Bring some Far East influence in with a pagoda style lamp.